"Condition Report" (2000) by Glenn Ligon. Iris print and iris print with serigraph. 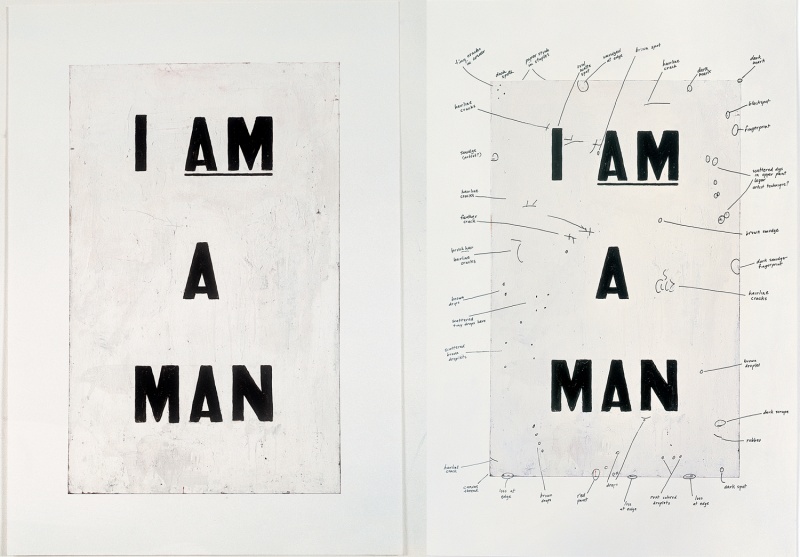 Condition Report consists of two prints of a painting Ligon made in 1988, Untitled (I Am a Man). Ligon produced a range of works based on borrowed texts, often dealing with the experience of being African-American through slavery and racial segregation. 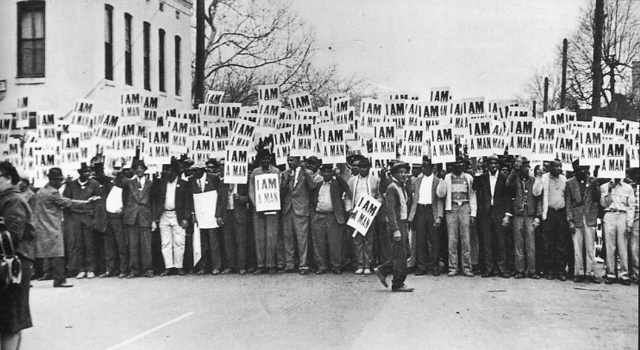 The text of “I Am a Man” was taken from a placard carried by a striking sanitation worker in 1968. The strike protested years of poor treatment, low pay and dangerous working conditions, and called for equal, humane treatment of African-American workers. The phrase, “I am a man” was a simple but powerful message, which drew attention to the inhumanity of treating people as inferior based on the colour of their skin, but also carried the simple demand for equal treatment – I am a man, the same as you, so treat me as such. No more, no less. Ligon took this placard and recreated it in 1988. Ligon’s recreation functioned as a reminder of the struggle, which, even twenty short years later would already have been fading in the collective conscience. In a way, Ligon was also probably appropriating the message for himself, as an African-American, and also as a gay man; for many the struggle for recognition as equal human beings was (and still is) far from over. Then, in 2000, Ligon had a painting conservator friend produce the condition report – an annotated print which highlights imperfections, cracks and other damage to the work which have accumulated over time. The print and the report are hung side-by-side, and together they are a stark reminder of the passage of time, both materially and historically. The statement “I AM A MAN” started out as an exasperated cry from an oppressed minority to be treated as human. Twenty years later, Ligon took it and turned it into art. As the protest placard became art, the anguished statement became subject matter. Then a decade later Condition Report was created. Surely a condition report is the ultimate in dispassionate analysis of a piece of work. Any merit, any message, even the subject is ignored as the cracks and scratches are marked and recorded. The condition report marks the passage of time since the original piece of work was created, but isn’t it more than just the paint which is fading? The original struggle is gradually forgotten as the message becomes art, and the art becomes an object. In placing the two side-by-side, Ligon is stopping us in our tracks, making us aware of the passage of time and our fading memories, lest we forget. (For more, see this interesting interview with Glenn Ligon for Museo Magazine). Notice how he is a “man” as opposed to being a woman. What hierarchal tendencies underlie the use of the word “man” as opposed to more generally “person”? In stating that he is a man, he is most certainly trying to imply some sort of brotherhood unity. But is he doing this at the expense of other species? At what point does equality become relevant: between races, between sexes, between mammals, between animate objects? Clearly the man hated animals and endorsed cruel practises towards them. He most certainly would have believed that women were inferior to men. And don’t get me started on how egotistical the statement is, the mindset of a man who feels the need to point out that he is a man is surely one of arrogance and pride. The man was a cruel and sexist tyrant. You make an interesting point about deconstruction and interpretation; although I disagree with most of what you’re saying, and you haven’t really taken into account anything about the context of the artist or the subject matter, I can’t really say you’re wrong. And you’ve shown that if you deconstruct something far enough, you can make it mean pretty much anything, especially if you’re fighting for a particular cause. Having said that, it also sounds a bit like you’re taking the mick… Are you mocking the artist, or art in general? Or me? Now you’re deconstructing what I said. Make it mean whatever you will! That’s exactly what I was trying to achieve! But why were you trying to achieve it? Do you think I should stop trying to engage with the art people produce? Thanks for the link, for engaging with what I wrote, and more importantly for engaging with Ligon’s work. To be honest, I think we agree. I was trying to make the point that Condition Report highlights the passage of time and draws attention to the way memories fade. So, rather than adding to that, by taking the reproduction of the placard and the report and putting them in a gallery, Ligon is drawing attention to the struggle and keeping at alive in the minds of anyone who views the paintings. And I’d be interested to hear what you thought about how I used the words “art” and “subject matter.” It’s completely possible I used the words clumsily or incorrectly – I’m not an academic, I just write about art I enjoy and the ways it makes me think. I’m always happy to learn! On further thought, and discussion with the friend that brought your post to my attention, I concur that we do agree fundamentally. I’ll admit that your use of these terms was more or less in line with the way most would understand them, and I usually don’t contest this usage, but considering the type of work being explored here, it’s of special importance to be very accurate. My issue with your language was that it seemed to make art out to be of a lesser value than the source/subject matter. Firstly, I think it important to distinguish ‘art’, ‘art work’ and ‘artifact’. The first is the knowledge or ideas that have no physical form, the next is the actual enacting of ideas, the very instantaneous performative effort to give the art some existence. Now what you may have really be getting at when you said “Twenty years later, Ligon took it and turned it into art. ” was the artifact. The artifact is the result of the art work and the physical manifestation of art. And though, this ‘third-person’ account of the actual art (here, the original protests; the artwork was Ligon’s research of the protest and appropriation of the sign) may be of less value than having been there to witness it, it’s the only way a kid in Maryland, USA in 2011 can even begin to interface with that moment and it’s associated emotions, issues or context. Otherwise, the moment is just that. In a nutshell I see Ligon’s work here (and almost all art) functioning in a similar way that other media (photography, television, word of mouth) should and therefor don’t agree with what seems to be an implied lesser value ascribed to the artifact versus the event. Without the work or artifact, the event itself wouldn’t even have a chance to reach much farther than those who were there to witness it first hand. And by the way, this is a cool blog, thanks for actually discussing art in an approachable way. Thanks for your post – that’s a helpful distinction between words I might have been using interchangeably. I don’t think the artifact has less value than a first hand experience of the event, but I think it does capture the fact that time moves on. And, as you rightly say, then it’s only through artifacts that any of us can experience events we didn’t witness personally. I think Condition Report manages to capture both of these. Thanks again for your responses – I really appreciate people interacting with what I have to say!